This is the Northwest Minnesota Birding Report for Thursday, November 25, 2010 sponsored by the Detroit Lakes Regional Chamber of Commerce. You may also hear this report by calling (218)847-5743 or 1-800-433-1888. What a difference a week makes! The northland is blindingly white now, and temperatures are hovering in the single digits. The snow has come nicely, with little of the great wind that was forecast, and it lies deep on everything. Feeders have been busy in the past few days, and a few late migrants have found themselves in unfamiliar circumstances. Sightings of the unusual category include the SUMMER TANAGER found by Ron Erpelding in Greenbush, Roseau County on November 19. It was not relocated after that day. On November 22, Larry Wilebski reported a VARIED THRUSH in fruit trees in Lancaster, Kittson County. Location is north of the railroad tracks- best place is north of Bergstrom's gas station- anywhere there are crabapple trees with fruit on them. This afternoon, November 25, I observed a YELLOW-RUMPED WARBLER feeding at one of our bird feeders east of Thief River Falls, Pennington County. Ron Erpelding made as swing through the northwest last weekend, and many of the sightings this week are his. He found BALD EAGLES, NORTHERN HARRIERS, and ROUGH-LEGGED HAWKS in most of the counties in the northwest. A NORTHERN SHRIKE, 5 SNOW BUNTINGS, and 3 AMERICAN ROBINS were seen in Roseau County on November 20. CEDAR WAXWINGS were found in Gonvick, Clearwater County, on November 18. A large flock of TUNDRA SWANS were on the rice paddies northeast of Gonvick. On November 20 , in Kittson County a RED-BELLIED WOODPECKER was relocated in Karlstad. Other species seen in the county included BOHEMIAN WAXWINGS and 4 AMERICAN ROBINS in Karlstad, and 5 SNOW BUNTINGS, 5 PINE GROSBEAKS, COMMON REDPOLLS, and 3 PURPLE FINCHES at Lake Bronson State Park. Maggie Anderson at Agassiz NWR reported that on November 13, a family of TRUMPETER SWANS with 2 cygnets was seen on Tamarac Pool. Many ROUGH-LEGGED HAWKS, and a SHORT-EARED OWL were also seen. An immature SNOWY OWL was seen on November 18 at Farmes Pool. Other species seen at the refuge in the past week included TUNDRA SWANS, HOODED MERGANSER, BALD EAGLE, SNOW BUNTINGS, and PINE SISKINS. Ron Erpelding found BOHEMIAN WAXWINGS at Middle River on November 19. In Thief River Falls, Pennington County, Ron Erpelding found a few BOHEMIAN WAXWINGS on November 20. A RED-BREASTED MERGANSER was seen in a sliver of open water at the wastewater treatment ponds. In Red Lake County, species seen on November 20 included NORTHERN SHRIKE, a GREAT HORNED OWL, 6 BOHEMIAN WAXWINGS east of MN 32 on a dead end road, and 3 CEDAR WAXWINGS in the town of Red Lake Falls. Sandy Aubol in East Grand Forks, Polk County, had a NORTHERN SHRIKE in their yard on November 23. Karen Suldahl saw CEDAR WAXWINGS and DARK-EYED JUNCOS in Climax on November 24. Donna and Leon Thoreson reported BALD EAGLE, ROUGH-LEGGED HAWK, AMERICAN CROWS, and BLACK-BILLED MAGPIES all feeding on a deer carcass at their home. 100 SNOW BUNTINGS and a LINCOLN'S SPARROW are visiting their feeders. NORTHERN SHRIKE, and LAPLAND LONGSPURS were observed in Mahnomen County on November 20. In Becker County, Beau Shroyer found 100 BOHEMIAN WAXWINGS on the shore of Big Detroit Lake across from Sunrise Lane on November 22. There were COMMON GOLDENEYES on the lake. A NORTHERN CARDINAL was seen at the visitor center at Itasca SP on November 21. 30 COMMON MERGANSERS were seen on Lake George. A flock of COMMON REDPOLLS was seen in Hubbard County by Marshall Howe. Thanks to Beau Shroyer, Donna and Leon Thoreson, Karen Suldahl, Larry Wilebski, Maggie Anderson, Marshall Howe, Ron Erpelding, and Sandy Aubol for their reports. Please report bird sightings to Jeanie Joppru by email, no later than Thursday each week, at [email protected] OR call the Detroit Lakes Chamber's toll free number: 1-800-542-3992. Detroit Lakes area birders please call 847-9202. Please include the county where the sighting took place. The next scheduled update of this report is Thursday, December 2, 2010. We love to brag about East Silent Resort’s proximity to Maplewood State Park. The gorgeous state park is Just a few miles from the resort…and a “must see” during your next vacation. Don’t believe us? 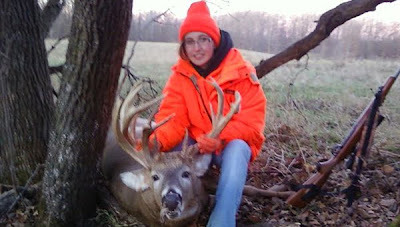 Check out this article about a HUGE deer that was bagged recently (http://www.fergusfallsjournal.com/2010/11/18/a-25-point-buck/). In addition to endless opportunities for hiking, biking, swimming, canoeing, horseback riding, and much more…Maplewood State Park offers some of the finest hunting and fishing in all of Minnesota. This is the Northwest Minnesota Birding Report for Thursday, November 18, 2010 sponsored by the Detroit Lakes Regional Chamber of Commerce. You may also hear this report by calling (218)847-5743 or 1-800-433-1888. Winter is definitely approaching as tonight we are experiencing snow flurries. Wind has been cold today, and that will encourage birds to get moving to warmer climes. Most species reported are birds that stay with us for the winter, but there are still some migration going on. It is the time to look for rarities. Dan and Sandy Thimgan in Battle Lake, Otter Tail County, witnessed a chase involving a sharp-shinned hawk and a pileated woodpecker on November 15. Brad and Dee Ehlers saw a barred owl a mile south of Ottertail on November 14. Several snow buntings were seen 6 miles south of Perham on November 13. On November 16, 22 trumpeter swans including one pair with 5 cygnets were seen in Otter Tail County. Alma Ronningen reported eleven American tree sparrows, a great horned owl, and several pine siskins on November 16. From Hubbard County, Marshall Howe saw close to 90 tundra swans on November 15. Many pine siskins have returned to their feeders. A light phase rough-legged hawk was seen near Dorset on November 13. Beau Shroyer in Becker County on November 13, saw 2 American black ducks on Lime Lake northwest of Lake Park. In Polk County , Sandy Aubol saw a white-throated sparrow. On November 17 a common redpoll came to their feeder. Donna and Leon Thoreson have had 4 American crows, and 3 bald eagles feeding on a road killed deer at their home. Many pine siskins are among the species visiting their feeders. In Clearwater County, Connie Cox reported 8 evening grosbeaks, some purple finches and a gray jay. On November 17, several black-billed magpies were seen along CR 2 and MN 200. At Itasca State Park, Connie Cox reported 8 trumpeter swans. A juvenile northern cardinal was seen at the visitor center feeders on November 17. In Beltrami County, Katie Haws reported northern harrier and common grackle on November 14. In Warroad, Roseau County, Beth saw pine grosbeaks last week. Perhaps the best sighting of the week was the scarlet tanager which showed up at Larry Wilebski's cabin in Kittson County on November 15. We hope the bird is winging its way south by now. In Beltrami and Lake of the Woods Counties on November 15, Beth Siverhus saw 14 rough-legged hawks; the northern hawk owl was still at his usual place along MN 72 at mile marker 49. Thanks to Alma Ronningen, Beau Shroyer, Beth Siverhus, Brad and Dee Ehlers, Connie Cox, Dan and Sandy Thimgan, Katie Haws, Larry Wilebski, Leon Thoreson, Marshall Howe, and Sandy Aubol for their reports. Notice anything new??? Our logo has been updated to reflect a growing and constantly improving East Silent Lake Resort. As your hosts, we are committed to steady improvement in our accommodation, amenity, and service. In Spring of 2011, we will celebrate the opening of our NEW luxury lake homes and guest suites – a new type of accommodation for East Silent Lake Resort and Otter Tail Country. In addition to symbolizing growth and improvement, the new logo also represents our unwavering commitment to family vacations and traditions. We look forward to seeing you in 2011. This is the Northwest Minnesota Birding Report for Thursday, November 11, 2010 sponsored by the Detroit Lakes Regional Chamber of Commerce. You may also hear this report by calling (218)847-5743 or 1-800-433-1888. The cold is starting to creep ever closer as we hear of snow in the western Dakotas today. The bleak landscape needs the warm white blanket now before the big chill arrives. There is talk of some flurries in the forecast - can the first real snow be far behind? In Lake of the Woods County, Beth Siverhus saw a NORTHERN HAWK OWL at the usual place along MN 72 south of Baudette near mile marker 49 on November 4. Beth reported BOHEMIAN WAXWINGS in Warroad, Roseau County, on November 9. In Kittson County, Bob Ekblad found a RED-BELLIED WOODPECKER and also a flock of COMMON REDPOLLS in Karlstad on November 4. Bob Ekblad found a SUMMER TANAGER in Gonvick in Clearwater County on November 6. From Agassiz National Wildlife Refuge on November 10, Maggie Anderson reported several ROUGH-LEGGED HAWKS and SNOW BUNTINGS, and at the office feeders, one EVENING GROSBEAK and a flock of PINE SISKINS. Gary Tischer reported 40 SANDHILL CRANES migrating on November 6. None have been seen since. BALD EAGLES and NORTHERN HARRIERS are still very common at the refuge. On November 10, there were 400 scaup on Parker Pool along with about 10 HOODED MERGANSERS. Shelley Steva and I found six TUNDRA SWANS at the Thief River Falls wastewater treatment ponds on November 7, along with an assortment of diving ducks. No scoters were seen that day. In Polk County, Bruce Flaig reported two EVENING GROSBEAKS at his feeders on November 10, while Sandy Aubol in East Grand Forks reported many PINE SISKINS and a PURPLE FINCH at hers. Shelley Steva and I did some birding in Polk County on November 7. We found many geese at Oak Lake near Erskine including some CACKLING GEESE. Other species seen there included a late AMERICAN WHITE PELICAN, GREATER SCAUP, LESSER SCAUP, and HOODED MERGANSER. At the Erskine WTP there was a SNOW GOOSE, and some TRUMPETER SWANS, while on the lake in Erskine were some BONAPARTE'S GULLS. A NORTHERN SHRIKE was seen at Glacial Ridge. Marshall Howe reported a dark phase ROUGH-LEGGED HAWK in Hubbard County on November 6. Other species seen in the county included RED-BELLIED WOODPECKER, SNOW BUNTINGS near Dorset, and PINE SISKINS. Alex Watson in Otter Tail County found WHITE-WINGED CROSSBILLS at Glendalough State Park on November 9. Thanks to Alex Watson, Beth Siverhus, Bob Ekblad, Bruce Flaig, Gary Tischer, Maggie Anderson, Marshall Howe, and Sandy Aubol for their reports. Please report bird sightings to Jeanie Joppru by email, no later than Thursday each week, at [email protected] OR call the Detroit Lakes Chamber's toll free number: 1-800-542-3992. Detroit Lakes area birders please call 847-9202. Please include the county where the sighting took place. The next scheduled update of this report is Thursday,November 18, 2010. This is the Northwest Minnesota Birding Report for Thursday, November 4, 2010 sponsored by the Detroit Lakes Regional Chamber of Commerce. You may also hear this report by calling (218)847-5743 or 1-800-433-1888. Moderately pleasant weather still prevails over the northwest, but can it last much longer? The birds are telling us that fall is nearing its end. Reports of snow buntings , and pine siskins are starting to come in. Can winter be far behind? Brad and Dee Ehlers reported 11 SNOW BUNTINGS four miles south of Ottertail on October 28, and on October 29 a flight of around 300 AMERICAN ROBINS flew over their place. Meanwhile in Hubbard County on October 29, Marshall Howe saw the first PINE SISKINS of the season, and on November 2, a ROUGH-LEGGED HAWK near Lake George. On November 3, there was a NORTHERN SHRIKE near Dorset. Jay Richards at Maplelag Resort in Becker County reported a BARRED OWL near the resort on October 28. Sandy Aubol found SNOW BUNTINGS in Polk County on October 31 - 40 near Angus, and more than 500 along CR 20 near Sherack. At home in East Grand Forks, she saw WHITE-THROATED SPARROWS, HARRIS'S SPARROWS, and a few PINE SISKINS. On November 3, there were CEDAR WAXWINGS and COMMON REDPOLLS, and a flock of 110 SNOW GEESE flew over East Grand Forks. In Red Lake County, Shelley Steva observed a late MOURNING DOVE along CR 1 on October 22. Zeann Linder saw a MERLIN in Thief River Falls, Pennington County on October 29. On October 30, 5 BLACK SCOTERS and one WHITE-WINGED SCOTER were at the Thief River Falls wastewater treatment ponds, while here at our feeder there were two AMERICAN TREE SPARROWS . On October 31, Sandy Aubol observed 2 SHARP-TAILED GROUSE, 4 BALD EAGLES, and two BLACK-BILLED MAGPIES along CR 3. Gretchen Mehmel at Norris Camp in Lake of the Woods County reported that a few EVENING GROSBEAKS have been coming to the feeders along with some GRAY JAYS. Thanks to Brad and Dee Ehlers, Gretchen Mehmel, Jay Richards, Marshall Howe, Sandy Aubol, Shelley Steva, and Zeann Linder for their reports. Please report bird sightings to Jeanie Joppru by email, no later than Thursday each week, at [email protected] OR call the Detroit Lakes Chamber's toll free number: 1-800-542-3992. Detroit Lakes area birders please call 847-9202. Please include the county where the sighting took place. The next scheduled update of this report is Thursday, November 11, 2010. This is the Northwest Minnesota Birding Report for Thursday, October 28, 2010 sponsored by the Detroit Lakes Regional Chamber of Commerce. You may also hear this report by calling (218)847-5743 or 1-800-433-1888. I think we have arrived at winter birding , and we are definitely in the season of the vagrants. Be on the watch for birds that have lost their way or strayed from the normal routes. This week, there are reports of snow buntings from several counties, and many fewer reports of sparrows. The nice weather has broken, and the first really chilly days are upon us. Sandy Aubol made a trip north on October 23 and reported 5 GRAY JAYS in Lake of the Woods County. Other species seen in the Beltrami Island State Forest included RUFFED GROUSE, RED-BREASTED NUTHATCH, HORNED LARKS, AMERICAN TREE SPARROWS, and SNOW BUNTINGS. In Roseau County Sandy saw SNOW GOOSE, BALD EAGLE, and BLACK-BILLED MAGPIE. In northern Beltrami County several BOREAL CHICKADEES were seen along the White Pine Trail off the Rapid River Road . Other species seen in Beltrami County included PILEATED WOODPECKER, BLACK-BILLED MAGPIE, and SNOW BUNTINGS. Jim Fitzpatrick , while in Clearwater County on the weekend observed SNOW GOOSE, TRUMPETER SWAN, COMMON LOON, BARRED OWL, GREAT HORNED OWL, and SNOW BUNTINGS. Here in Pennington County, Keith and Beth Wheeler in Thief River Falls, had a visit from three EVENING GROSBEAKS at their feeder on October 22. On October 23, I found 4 SURF SCOTERS among the scaup at the Thief River Falls wastewater treatment ponds. This morning a late GREAT EGRET was standing alongside the Red Lake River east of Thief River Falls. On October 24, a NORTHERN SHRIKE was seen along Johnson Drive east of the city. Sandy Aubol reported BALD EAGLE and SNOW BUNTINGS in Polk County this week. Kim Eckert's Minnesota Birding Weekend group was in Polk County this weekend. Highlights included GRAY PARTRIDGE, SHARP-TAILED GROUSE, GREATER PRAIRIE-CHICKEN, AMERICAN GOLDEN-PLOVERS, and NORTHERN SHRIKE. EURASIAN COLLARED-DOVES, and a RED-BELLIED WOODPECKER were seen in Fertile, and three RED CROSSBILLS were found at Glacial Ridge NWR. In Mahnomen County, a ROSS'S GOOSE was found at the Mahnomen wastewater treatment ponds, and a RED-BELLIED WOODPECKER was seen at the park there. Rick Gjervold observed a GREAT EGRET on October 21 flying over the highway just south of the Moorhead Cashwise store in Clay County. Herb Dingmann found 3 WHITE-WINGED CROSSBILLS at the Hawley Golf Course in the spruce trees near the entrance on October 24. Brad and Dee Ehlers saw a NORTHERN SHRIKE on October 21 eleven miles north of Morris, and on October 22, saw two FOX SPARROWS, both in Otter Tail County. Thanks to Brad and Dee Ehlers, Herb Dingmann, Jim Fitzpatrick, Keith and Beth Wheeler, Kim Eckert, Rick Gjervold, and Sandy Aubol for their reports.